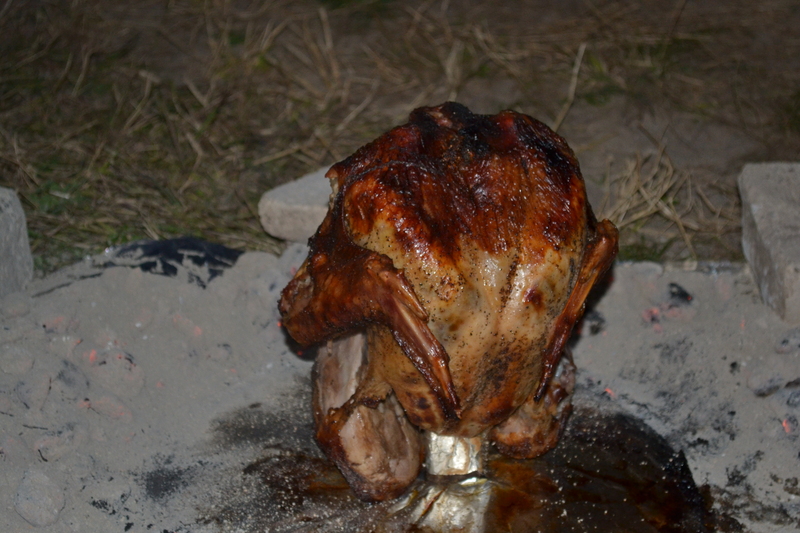 Preface: My enthusiasm was greatly deflated when, on a whim, I checked the internet on the off -chance that someone in the blogosphere had also had the mind-blowing experience of preparing a turkey without the use of electricity or a bbq pit. I discovered, much to my dismay, that apparently every other person in the civilized world not only prepares trash can turkeys on a fairly regular basis, but writes up their experiences and findings on their blogs. However,I refuse to be daunted by this newly discovered revelation. Keep in mind my innocent enthusiasm as you read my thoughts… and know that I’ll try to get out more. I’ve just gotta say that this is the coolest idea I’ve seen in a long time. It’s the perfect solution for preparing a holiday feast without the use of a conventional oven. Imagine a power outage, Thanksgiving at the hunting camp (as in this case), or perhaps having the family over during a zombie apocalypse. This brilliant idea allows a deerslayer’s wife to come through in the face of disaster or just impress the pants off everyone, gaining the admiration and awe of all. Many thanks to my dear friend, Christine DeBolt for sharing the idea. 1. Prepare your turkey. You can brine it, inject it, or just season it the way you prefer. 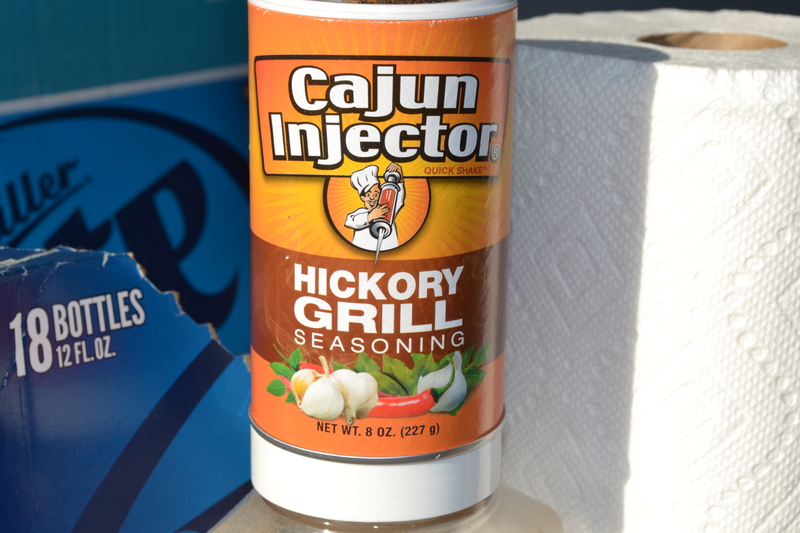 This turkey was brined and injected with Cajun Injector Hickory Grill Seasoning (from Academy Sporting Goods). 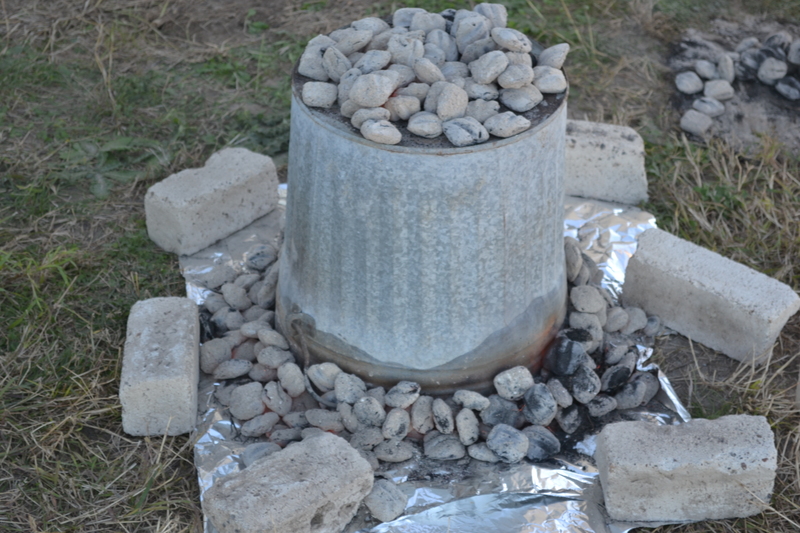 While the turkey rests, set up your outdoor cooking area. 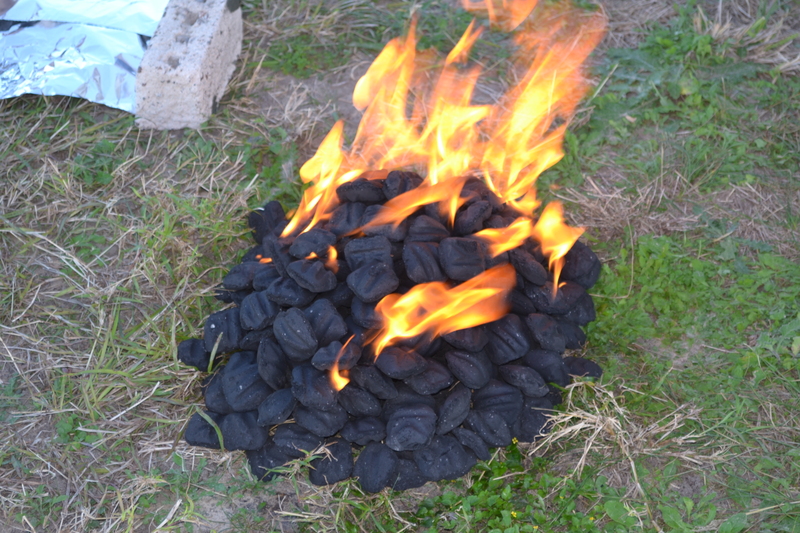 Either in a pit or on a grass-free area of dirt near where you will set up your cooking area, start 10 pounds of charcoal. Lay and overlap foil in about a three foot square on a relatively flat area that has enough soft soil to pound the wooden stake into the center. Place rocks or bricks around the perimeter. Pound wooden stake into the center of the square. It needs to go about 4 or 5 inches deep. 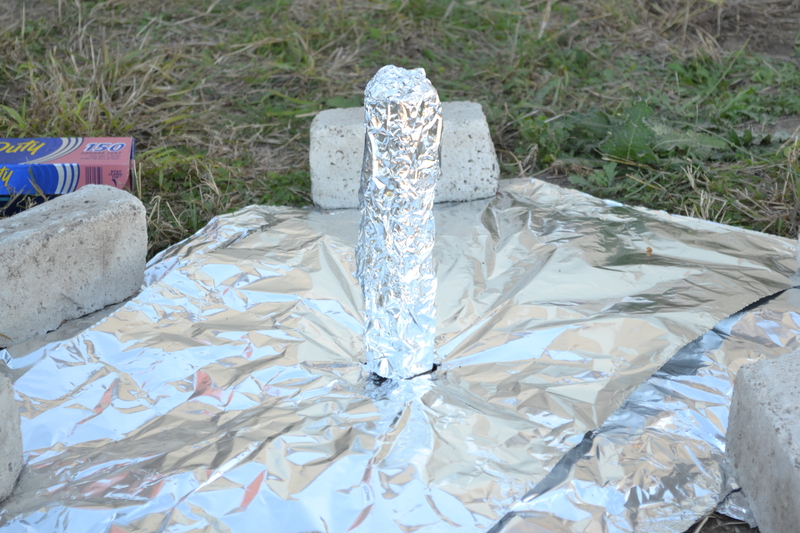 Wrap stake with foil. “Insert” turkey onto the stake thusly. Make sure the turkey is comfortable! 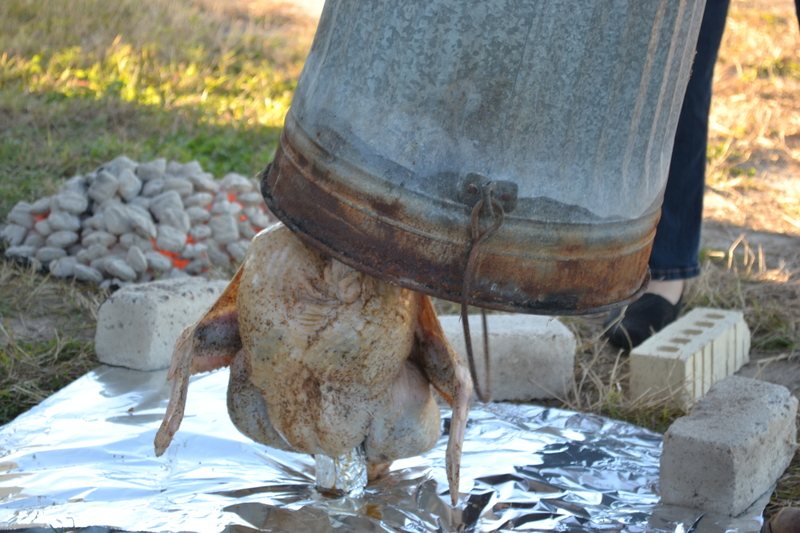 Place inverted trash can over the turkey. 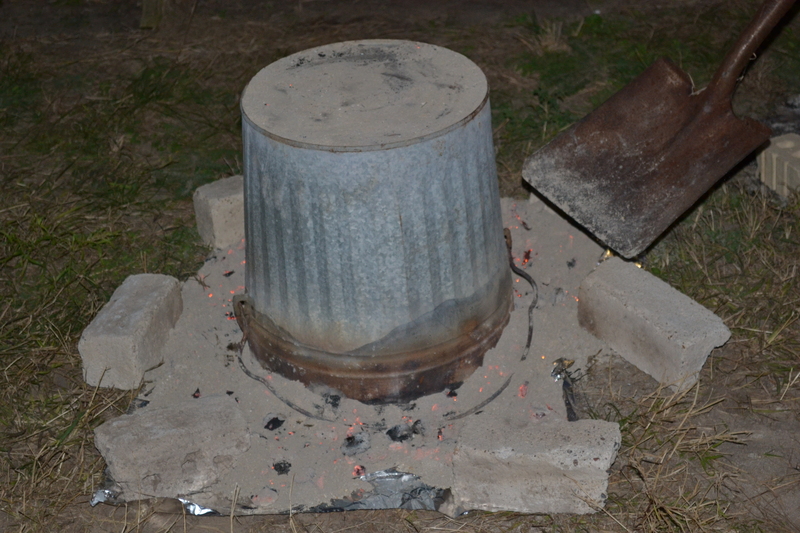 Shovel white coals around the outside edge of the trash can and on top. After about an hour and a half, the turkey should be ready to eat. 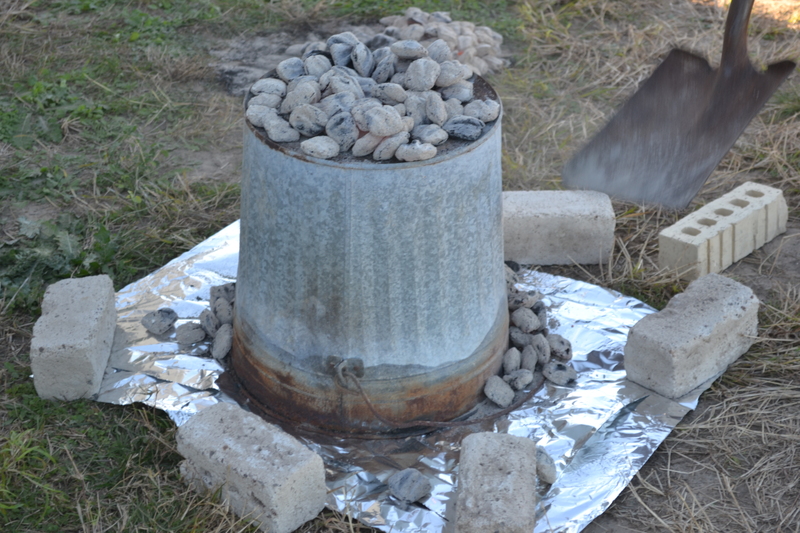 Carefully use the shovel to pull the coals from around the trash can and from the top. 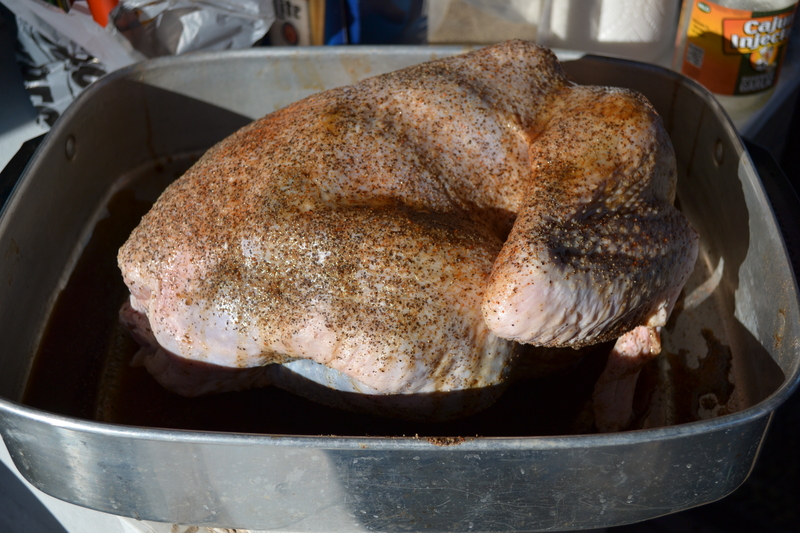 Using heavy gloves, lift the trash can and check the turkey. The meat should be starting to fall from the bones. The meat literally was falling off the bone! Once again, excuse my excitement. Not to be outdone by everyone in the civilized world, I want to try this method on a wild turkey and maybe a goose, adjusting the times based on the size and leanness of the meat. Wish me luck. I see a lot of potential here beyond turkey…. 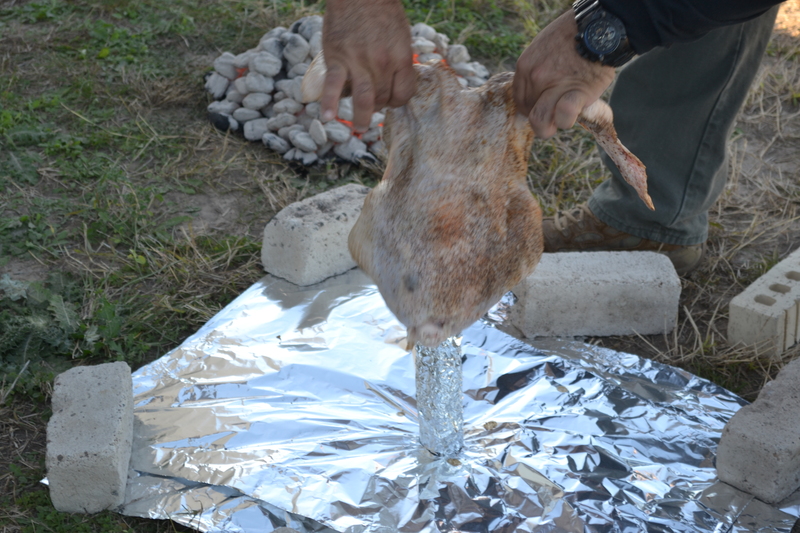 If you do goose, and a wild one, I would try to keep the heat lower and make the cook time longer. Wild goose toughens up into liver jerky suuuuper quick. It needs to either me med-rare, or slow cooked/braised to oblivion. Domestic goose might be different- I’ve only ever cooked Canada honkers. Re: power outage at Thanksgiving- that happened to us once. My hometown’s power grid probably hasn’t been updated since the 50s or so. As a result, even the hint of a thunderstorm nearby knocked out power. My senior year of high school, we got a storm that first dumped almost a foot of heavy, wet snow, and then the freeze line turned back to hover over us, and we got freezing rain. Over half an inch of ice accumulation if I remember right. A thick coating on everything. It took down whole trees, lots of power lines, transformers, whole telephone poles. Our furnace had electric parts and thus wouldn’t work. But our oven was gas. We were without power for two days and one night. We slept that night under I don’t remember how many blankets, and spent most of both days baking to stay warm. 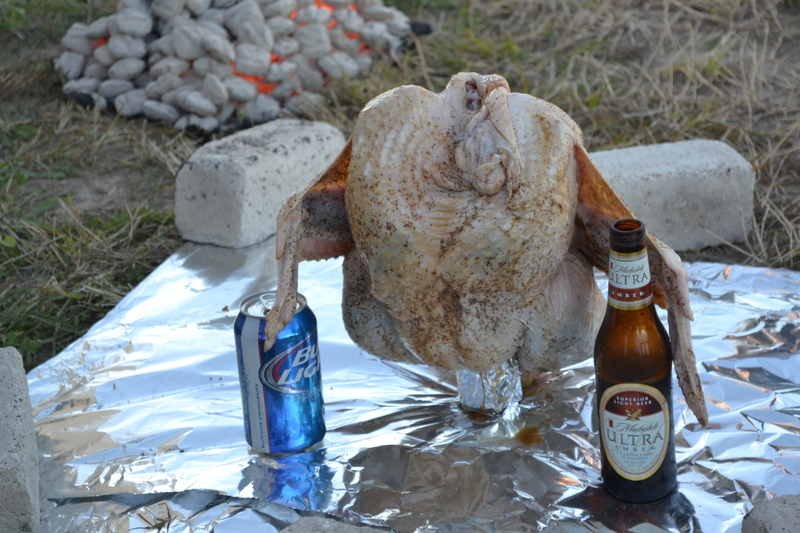 We didn’t have a turkey, but I imagine it could have been done. Nobody in my town had Thanksgiving that year. That’s an incredible story. Down here in southern parts, I have trouble even fathoming the cold. We did live in the panhandle for a while and we got a lot of cold weather up there. 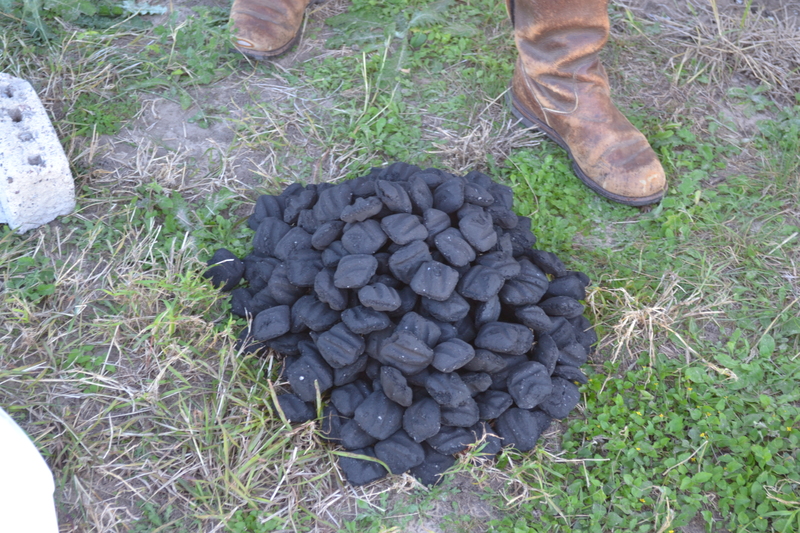 Remember that, in Texas, it doesn’t take much to shut everything down. And it usually did. Thanks for the heads up on wild goose. Last year, I checked out our local grocer for a goose. $65!!! We had turkey. That is a cool idea, Mrs Deerslayer! 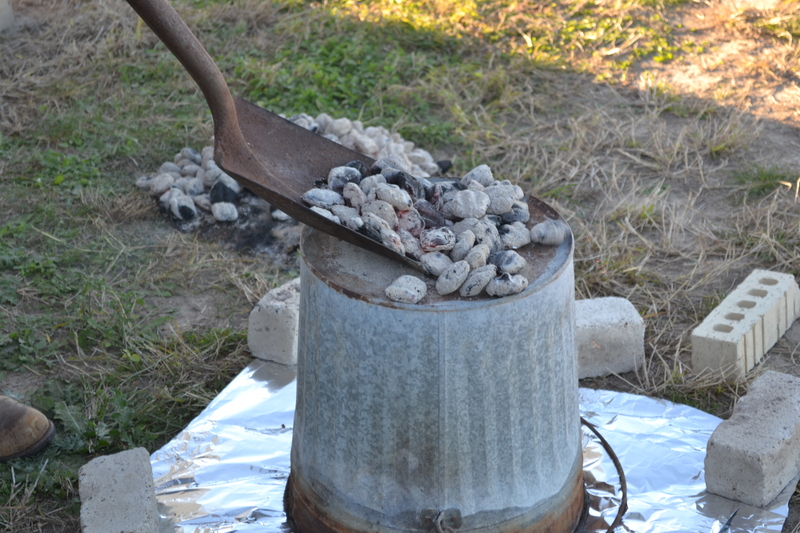 You done made a trash can dutch oven. It’s sealed off pretty well too, unlike conventional pits with vents & dampers, so I reckon it was quite moist inside there, which would indeed promote a moist end game. 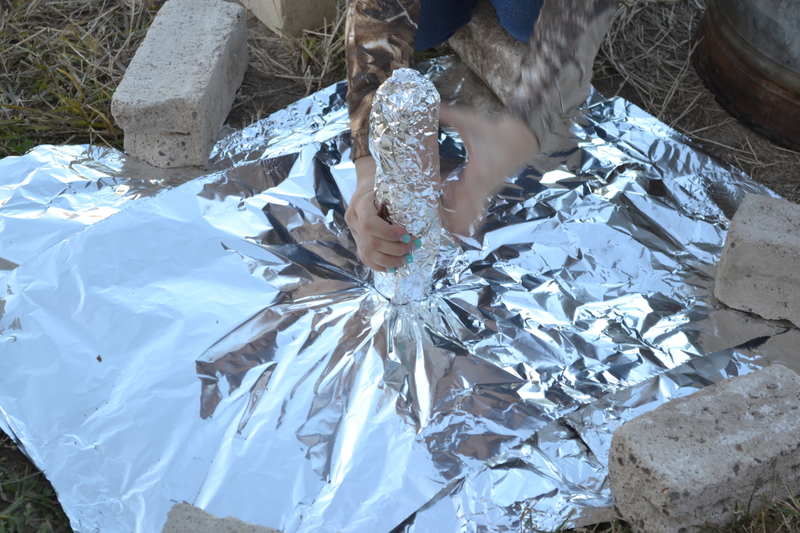 Kind of like wrapping the meat in foil. Fabulous! Looks mouth watering too. Very cool idea. Thanks for passing it along. Who needs a thousand dollar big green egg! Merry Christmas, Mrs Deer slayer, to you and yours. I’m so glad you’re excited about this idea, too. No $$$ necessary, just utter simplicity to bring enthusiasm and excitement . Perhaps there’s a Christmas lesson in there, somewhere. Have a simple, blessed Christmas. 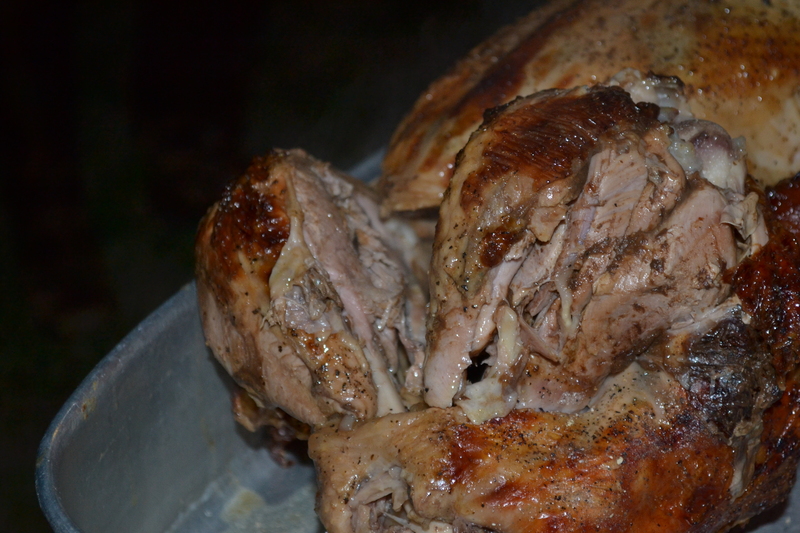 I am so glad that I shared this with you and your family and that y’all are enjoying this cool way of cooking a turkey. Beto was clever to place the beer for this picture. Hey Christine, wasn’t that a great time. When you told me your plan for the turkey, I never would’ve guessed it would be such a success. We were just saying how much we miss hunting and hanging out with you guys at the E Lazy E.
Christine, I have updated this post to make sure that you get the recognition you deserve! Hugs to you and Paul.